Here on the eve of Cadie's 15 month birthday, we've been noticing that she's doing pretend play. A little at least. 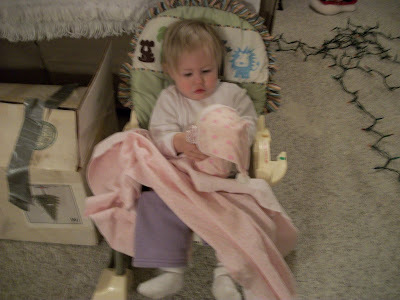 I took this picture last week of her with a new baby doll her Dassa gave her. Almost right away, Cadie started calling it "baby" and wanted to put her blanket on it. She picks it up and hugs it, and I can see how before we know it, we'll be wanting to get her a doll bed and accessories so she can care for her dollies. Today she found our little remote control. She was carrying it around when I noticed that she was holding to the side of her face and saying "Hi, Daddy! Hi, Daddy! Hi, Daddy!" We've already bought her a toy phone for Christmas, so she'll love that. I am enjoying being home with her during the day. It'll be really great once we settle into a routine - last week was weird working both jobs and this week we've had other things going on some days too. I actually woke up this morning at some point and thought - I have to get up to get Cadie to school! Then I remembered happily that she doesn't go to day care anymore. Still, I'm really looking forward to Christmas break when I'll have a good chunk of time with no work at all. Yea! WOW. Cadiebug is speaking so much more than when we were with you at Thanksgiving. Glad you are enjoying time with her during the day. She is such a cutie little girl! We will need to have play dates during Christmas break! I know the girls would just love it! How precious it is to see her loving her doll so much. That makes me so happy. When I first gave it to her, she said, "Baby". I can't wait to see her rocking her baby. She is so dear. Thank you for giving us a little granddaughter! What a joy she is.I know your time at home will get better and better.